Today I’ll be sharing some of my favorite quick and easy healthy halloween treats to help you spookify snacktime. They’re REALLY easy!!! As in zero Pinterest skills required! Pinky promise. I love Pinterest, I do, but what I’m not in love with is spending hours on an OMGSOFRUSTERATING project just to have it look like something out of a horror movie. Halloween is probably one of the more forgiving holidays for cutesy foods and crafts because even the most henious of Pinterest fails can easily look like it was done on purpose. Oh that half-melted cookie monster pile of goo? I was totally going for a scare-the-pants-off-your-kids vibe with those! Don’t judge meeeee! 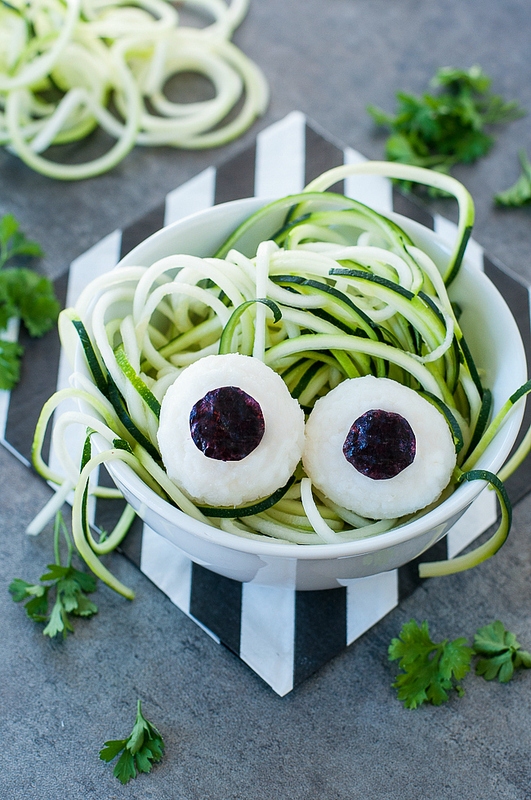 These healthy Halloween snacks are quick, easy, and frusteration-free! There are two fabulous ways to make this spooktacular snack and the amount you make can vary from a small snack plate to a full party platter! Little hands can help with this one too so feel free to enlist some help. You’ll want to use a few festive mini cookie cutters for this one. They can be purchased anywhere from Target to craft stores and can even be ordered on the interwebs. These are the ones I have and I can’t wait to order the alphabet ones next! option #1: Using an extra-sharp knife, cut a block of mild cheddar into thin slices, lengthwise. option #2: Save time by snagging pre-cut cracker-sized slices of cheddar, they’re the perfect size for mini cookie cutters! I tried both methods and have to admit I’m a fan of the cracker slices. I picked the one that was on sale that week and couldn’t be happier with how easy it was to cut out spooky halloween shapes with my toddler! She loved helping create these cheesy snacks and of course eating them was pretty darn fun too! 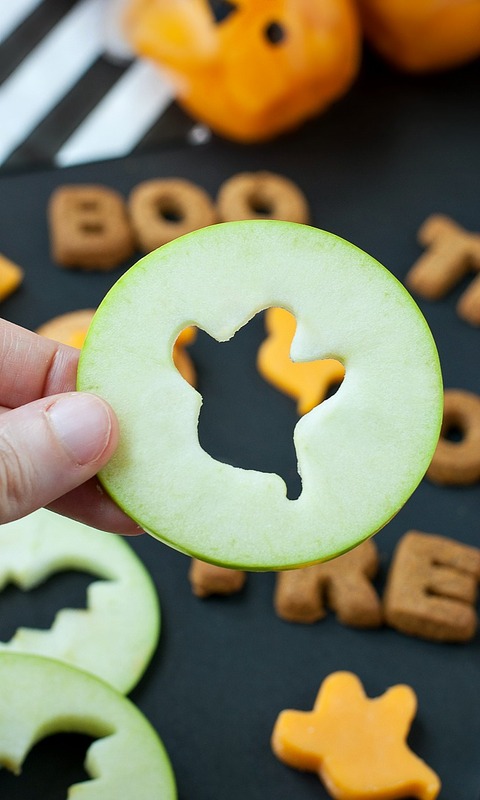 All you have to do is press the cookie cutters into the cheese and pop out the spooky shapes. Done deal! Save the leftover cheese from your cookie cutter palooza for tasty pizza night or taco night toppings! To make sure I really got my money’s worth out of those mini cookie cutters, I put them to use once more on a pile of apples. Simply slice your apple into thin discs and cut out the core using a cookie cutter. Eat them straight up or dip them in peanut butter (With an optional halloween sprinkle topping! Hello festive!) or your favorite flavored greek yogurt. You could even drizzle them with melted dark chocolate for an antioxidant boost and a burst of sweetness. 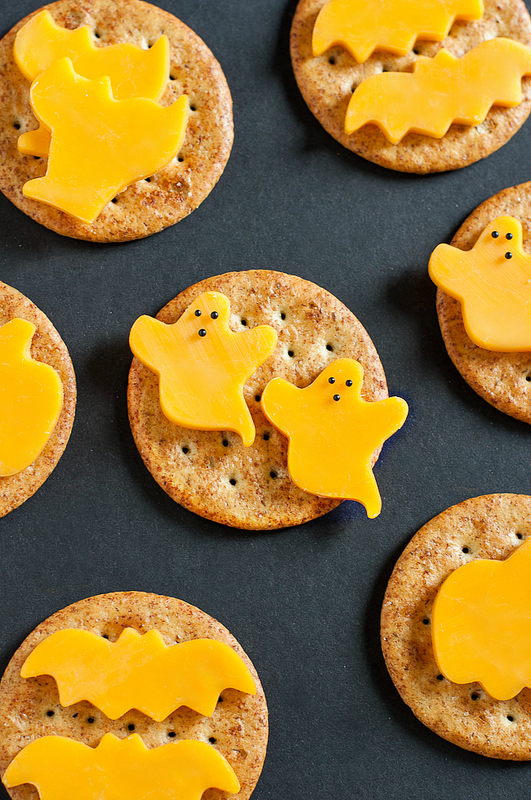 Another awesome option would be to to take the cheese squares you saved from your cheese and crackers snack (They’ll have a cute little halloween cut out in each square!) and serve them on top of their matching apple slices. This is totally how I ate mine; I LOVE apples and cheddar! You can also cut shapes into cantaloupe and honeydew for more fruity fun. These win favorite snack of the year from the chickpea. She is obsessed with all things pumpkin and begs for these little jack-o-mandarins daily. The best part is that they’re essentially the easiest thing ever. Channel your inner Picasso and scribble pumpkin faces onto juice-packed fruit cups. Pack them in lunches, serve them at a party, or enjoy them all month long as a healthy and delicious snack! If you get a chance to try these healthy halloween treats or invent your own creation, let me know! You can leave me a comment here (LOVE checking those daily!) or tag @PEASandCRAYONS on Instagram so I can happy dance over your creations. I can’t wait to see what you whip up! Hi there! I was just wondering where you had gotten your cookie cutters from to make the Halloween cheese and crackers. Thanks! What did you use for the black eyes on the cheese ghosts? This time around I used little black nonpareil sprinkles but I’ve also used poppy seeds and black sesame seeds too and all work great! Candy corn is my favorite Halloween goody. I love milky ways! so good. I can’t wait to buy some. Hmm – my favorite Halloween treat is probably Kit Kat or Reese’s! What a wonderful memory! Family-made treats are the best! <3 Thanks for sharing Cindy! My favorite Halloween treat? That’s a hard one! I have a huge sweet tooth, and pretty much love all candy. I guess my answer is any and all candy, lol! My favorite Halloween treat is snickers! My favorite Halloween treat is ALL the candy. I always buy a little extra for me. I love Reese’s Peanut Butter Cups. These are so cute and simple! Perfect toddler treats! I love Hershey’s Kisses – any flavor! My favorite Halloween treat is more for fall. My mother in law calls it a harvest mix and it has peanuts, m&m’s, candy corn, golden grahams, and pretzels. The perfect amount of sweet and salty! I am definitely going to make the cheese slices for my daughter! I love Reese’s pumpkins this time of year. You guys will have a blast making them! My toddler is all about those cookie cutters! Great ideas! My favorite Halloween treat is Peanut M&Ms. I would like to try the Chocolate Beet Cookies! My favorite Halloween treat is caramel apples! Those cookie cutters are the best! My kids would love them!! Such great Halloween ideas. Great ideas! My favorite is the Orange Chocolate Beet! Thanks Linda! That’s our favorite too! It’s a classic! I’m craving some now! Yum! Caramel on apples and I’m good to go! Cookie cutters to the rescue! 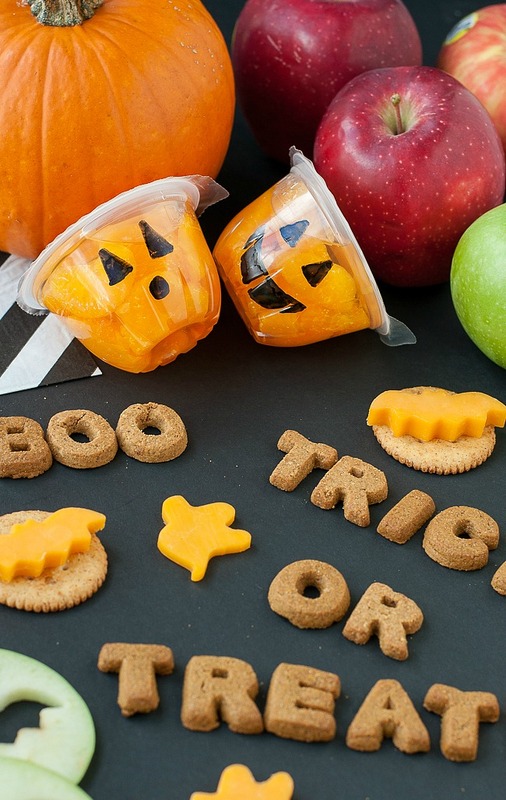 These are such fun and cute ideas for Halloween! Aw thanks so much Trish! Malted Milk Balls at Halloween time are my favorite! my fave Halloween treat is anything dark chocolate like a justins pb cup! Caramel apples is my favorite Halloween treat. This year I’m planning on making Halloween Rice Krispy Treats with some Boo Berry cereal for my coworkers. I love rice krispy treats! That’s such a fun idea Kaylin! Pumpkin cookies or bottle caps! Hi! I’m a sucker for chocolate on Halloween but especially now that I have kids I get so excited about all these healthier Halloween treat options! I’m right there with you! I’m probably going to eat most of the kiddo’s trick or treat goodies and I’m a little excited about it 😉 Haha! I just made some pumpkin dip the other day, I think it would be a great Halloween party food. 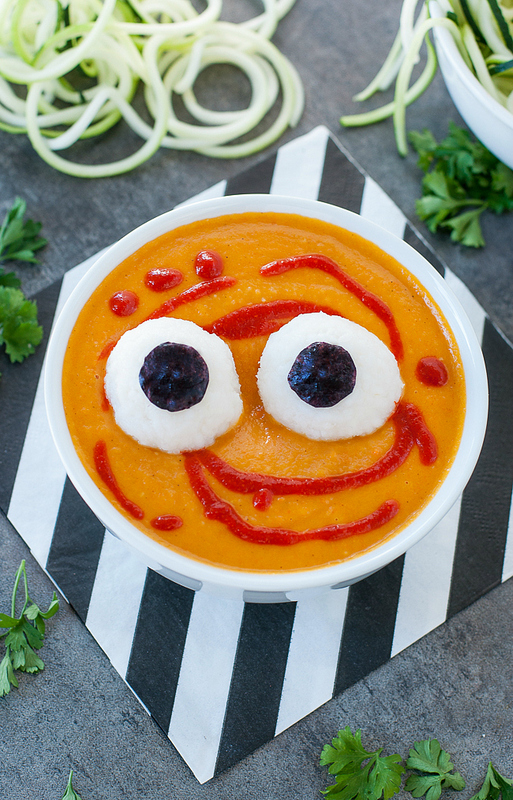 Love a good dip, and yes totally an awesome Halloween party dish! I love halloween! I love the dark chocolates like milky ways and kit kat bars! Thanks Jocelyn! LOVE popcorn balls – great idea! Thanks for the cookie cutter link! Last year for our halloween party I made little pumpkins with oranges and a small piece of celery for a stem. They were a hit! Beyond adorable! We can’t get enough oranges so those are perfect! How cute are these!! You totally nailed them! My kiddos will go crazy for this idea! I love this!!!! Great cute stuff! I’m such a Halloween fan and so is my kiddo! This is my first Halloween with a toddler and OMG – it’s already so much fun! Thanks Ashley! Hahaha I love the bat melon! Thanks Ashley! PB is always deeeelicious! We love Smart Cookies too!! I’m excited to try the mini cookie cutters, great ideas! My favorite Halloween treat is my Mom’s homemade pumpkin bars! They are simply the best! ? Veggie hot dogs wrapped in a crescent roll to look like a mummy is my fav Halloween snack for the kiddos. These cookie cutters are adorable! My favorite Halloween treat is the pumpkin candy corn (yes, it has to be the pumpkin shaped ones…I’m weird like that)! Those are so stinkin’ cute! I almost picked some up last week! I adore cookie cutters because they come in handy in so many situations!! Love these ideas! Thanks Beth! I keep a bucket of them under my kitchen sink for all kinds of crafts and recipes – they’re the best! My favorite Halloween treat is…maybe Reese’s peanut butter pumpkins?? So hard to choose!